We rode the 4-wheeler to put out three cameras and this was the first of the three we Dustin put out. Notice the gun was in case we ran across any snakes--I know this is so naive of me but snakes weren't even on my radar that day until D told me to watch where I stepped. I had to snap this as we were headed back to the truck to grab the other bags of corn and cameras. Y'all, as you can see by my hair, I was not expecting a crazy ride through the forrest, ducking my head, getting scraped by branches and briars, and getting my hair caught in vines. Next time I'll know to wear a ball cap haha! I caught my #bloggerhusband taking pictures of me working 😂 And by working, I mean he emptied the 50 lb bags of corn until they were about 25 lbs, and then I took over. Look at how good I am at spreading out corn! We got back to our house around 1 PM that day, and after an afternoon full of grocery shopping and laundry, I got ready to go see a play with my mom! The College Street Players, a local group, put on Steel Magnolias in our town, and since Mom and I both LOVE that movie, we had to go see the play! I could quote almost all of the lines verbatim, and even if you've seen the movie a thousand times and know exactly what's going to happen, everyone in the fine arts center cried during the last scene. I have three favorite movies: When Harry Met Sally, Pretty Woman, and Steel Magnolias. My love for all of these movies came from my mom, so it was special getting to watch the play together! 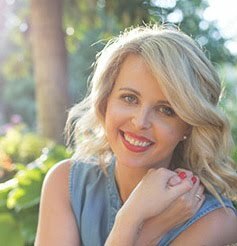 Follow me on Facebook, Instagram, Twitter, and Bloglovin! Happy Friday, y'all! Today I'm linking up with some of my favorites to share my favorite things with you today! When I posted last week about the items I was going to keep from the NSale, I mentioned returning the Paige jeans that I ordered because they were so high-waisted, and I'm just not a fan of jeans zipping up over my belly button. 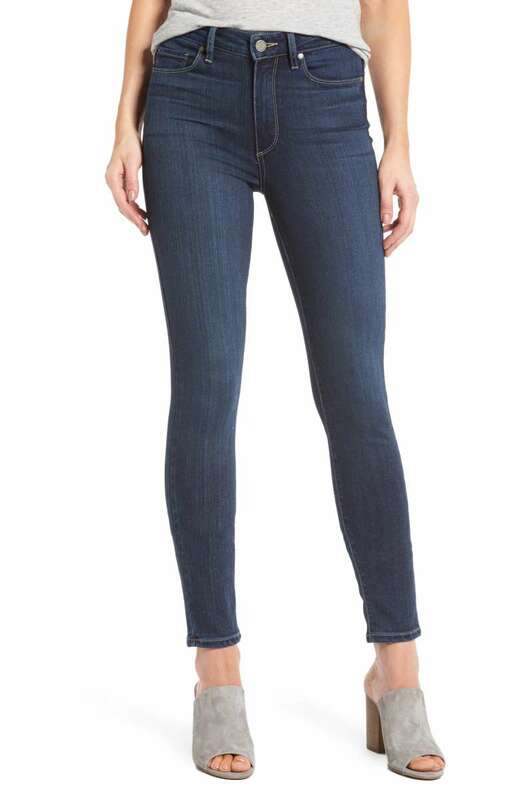 I ordered a 7 for All Mankind pair ($100 off!!) and they came in yesterday. I love them! They are a mid-rise so they button right below my belly button which I prefer. They are also a raw hem, and I'm loving that right now! Anyone else this picky about jeans?! My mom is an elementary science teacher and she hosted a science club earlier this week for about 30 students. Dustin helped out and I stopped by so I could hear him talk about what he did with endangered species in his job before we married. Random but this is my favorite spaghetti sauce to use! I find it at Kroger in the healthy section and it has only 4g of sugar. I didn't realize how much sugar was in spaghetti sauce until a few months ago. Kroger had one that had zero sugar but it was almost $12 for the bottle...no thanks! I know I could make my own, but also no thanks haha! Today marks our three year anniversary. Yes, we got married the day after Dustin's birthday which is something I might have re-thought if I had to choose a different date haha! It's been a crazy but fun three years of marriage and I wouldn't want to do it with anyone else! -Dustin got me to try pickled okra and I'm hooked! -We moved to a new church and joined! 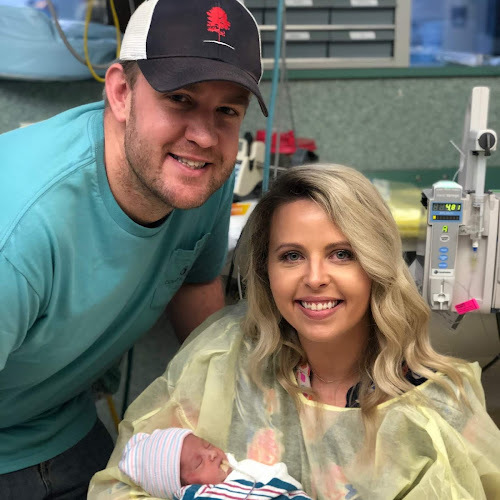 I know we did way more than this list--we went out to eat multiple times, played wiffle ball in our back yard, watching TV together, laughed together, and cried together. Dustin, I love you and you're the best thing that ever happened to me! Follow me on Facebook, Instagram, and Bloglovin! Happiest of Birthdays to My Wonderful Husband! Today my wonderful, handsome husband turns 32! I'm so thankful he was born 32 years ago and I cannot wait to celebrate his birthday tonight! 1. He's the hardest worker I know. 2. He's left handed but can bat and golf right handed. 3. He has to make a list about everything. Everything. 4. He's extremely OCD about our finances and I know I can trust him completely with managing our money. 5. He knows everything about sports and stats--high school, college, professional sports...he knows it all. 6. He has a few reality tv shows he enjoys watching with me and right now, Southern Charm is his favorite. 8. He's a great encourager. I can be having the worst day and Dustin gives pep talks that I can only describe as locker room halftime speeches. 9. He's accident-prone and also prone to getting food on his clothes. 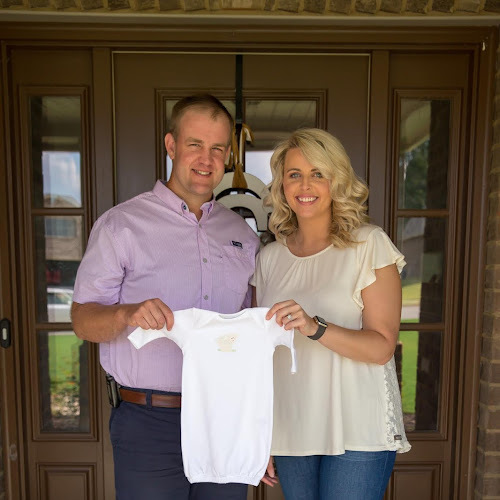 Bonus: He is an Auburn graduate but an Alabama fan! ROLL TIDE! I worked on school work on the computer while Dustin napped/slept beside me. Happy Friday! Sadly, I go back to school two week from today 😩 While no one really wants to go back, I know I'll be ready to get back to the routine and for fall to hurry on up and get here! Today I have a few favorites to share with y'all! Last week Dustin and I took a little day trip, and we ate at a pretty popular Italian restaurant in that town. I ordered the pizza and didn't realize how massive it would be! Dustin enjoyed his meal and part of mine, and then the rest of mine became his lunch for work the next day haha! Day trips are my favorite thing to do! We walked all over that downtown together. I've always made my bed. Always. Growing up, the only day I wouldn't have to make my bed would be my birthday because that was one of my mom's treats to us, but when I got to a certain age in high school, I was so OCD about making my bed a certain way that I would ask her to not make my bed on my birthday 🙈 All of that to say that when Dustin and I got married, I let him know that the bed had to be made every single day. He occasionally makes the bed--especially during the school year and I have to go to work and he's off. This summer he's occasionally made the bed even though I've been home (a FAVORITE!!). I'm sharing this photo for two reasons: Dustin made the bed one morning before I got the chance to and I ignored my OCD tendencies to want to rearrange the pillows and left as is! Win-win for all! I took this after I got done eating (because I was way too hungry to snap a pic before ha) but we went to eat at a Mexican restaurant that we never go to but both love! This summer has been filled with way more eating out than we have ever done! Mom rode to church with us this past Sunday and it was a FAVORITE! It was so nice to spend that time together! I made THIS RECIPE earlier this week and YUM!!!! And because the Nordstrom Anniversary Sale opens to the public today, I thought I'd share what worked for me/what I loved without doing a separate blog post on it. The cardigan above is a surprise purchase and love for me because I'm not really a fan of cardigans. 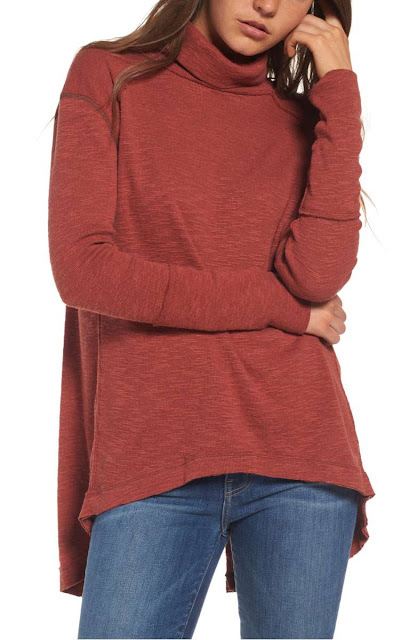 I'm glad I purchased this one though because it'll look great with everything in the fall. Side note: I told my bff about this purchase and she couldn't believe it because she knows how anti-cardigan I am ha! I showed this sweater on IG stories and got so many compliments on it! If I could wear it now, I would! I was going to keep these jeans because the fabric is so comfortable, but they are high-waisted and after thinking it through, I don't like high-waisted. So I have this pair that shipped this morning. What was your favorite item from the sale, or if you are just now buying, what are you hoping to get?! I'm a huge fan of eating breakfast for supper. HUGE fan. 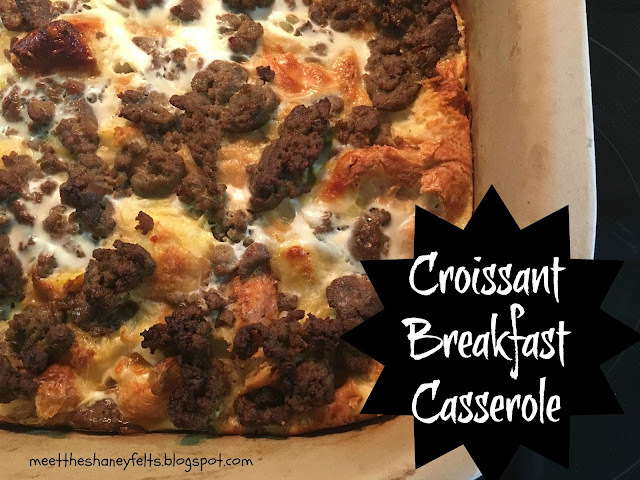 So when I saw a simple variation of my favorite kind of breakfast casserole floating around the Internet, I thought I'd tweak it a little and make it myself! 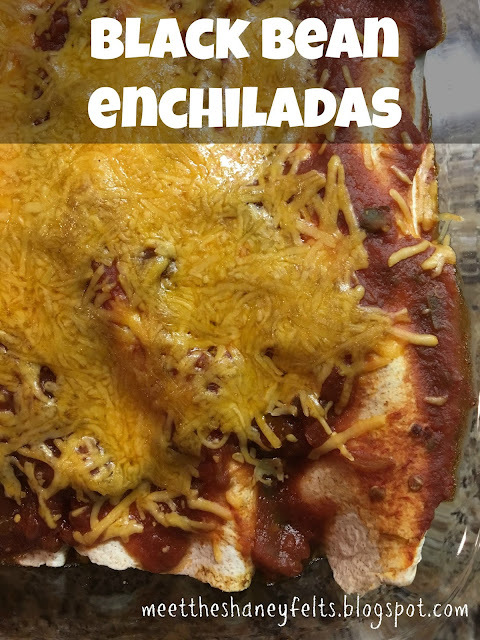 I made this for supper but I know it'll be even better for breakfast in the morning. 2. Tear croissants into bite sized pieces and spread evenly in your baking dish. 3. Brown sausage and remove grease before layering over the croissants. 4. Add the eggs and milk to a large bowl and whisk together. Add salt and pepper before pouring over the sausage evenly. 5. Bake for 55 minutes. Let sit for 5 minutes before cutting and serving! Not only would this be perfect to serve your family, but it would also be perfect for a brunch with friends! Happy Friday, y'all! Yesterday was a really busy day for Dustin and I, so I got up bright and early (I'm talking 4:30AM) to shop the Nordstrom Anniversary Sale. Priorities, right?! If you remember from my Beginner's Guide post on Wednesday, this is the first year for me to be a cardholder. Once I got on the site and started scrolling through, I added items I loved to my shopping bag. After only making it halfway through the pages in an hour, I had 19 items and definitely had to start nixing some of those items. It was REALLY HARD to narrow down to a reasonable amount of money, and so today I want to share what I bought with y'all since they are all FAVORITES!! ALSO: Be sure to check my IG (@saraheshaneyfelt) for a chance to win a $300 Nordstrom gift card to use during the sale!!! The contest ends tomorrow night. I'm so excited about this scarf! I've been wanting a leopard scarf forever and this one is CHEAP! I'm anxious to get this shirt in the mail. 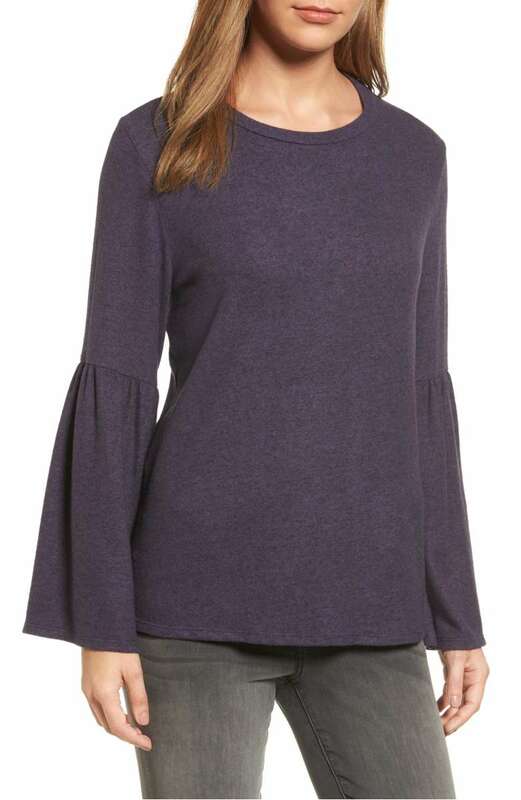 I love the bell sleeve trend because it's something I feel could be timeless, but the fabric was described as a fleece so I'm hoping this is dressier and not like a sweatshirt. 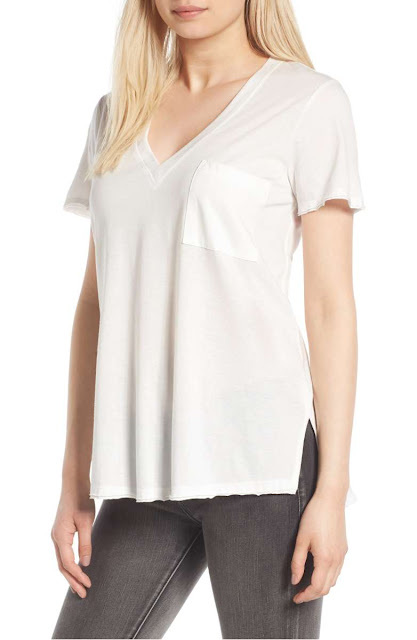 This is the basic tee I wanted! Another blogger said it wasn't see-through even though it looks like it. This is so cheap right now, too!! Who doesn't love scallops? I loved this dress in a light blue that it also comes in, but I feel like the dark green can transition easily to fall. So excited about this sweater!!! 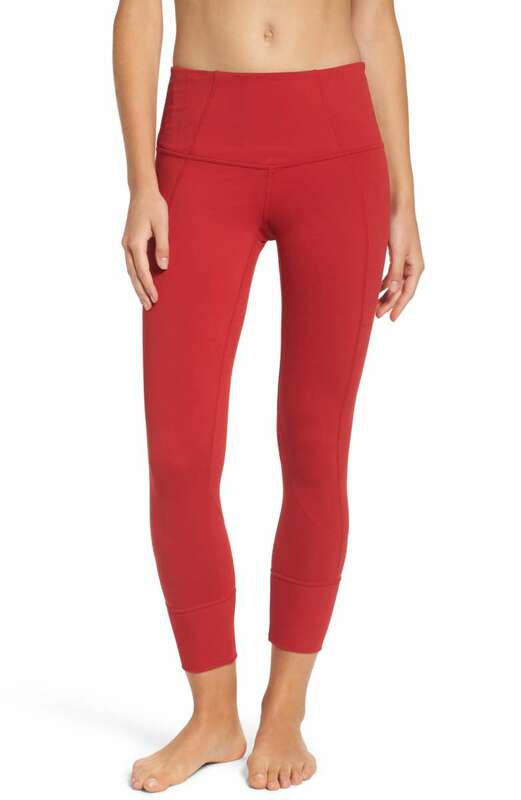 I've been wanting some midi length leggings for a while now, so I was able to snag these in black. Black is now sold out, but I do love the red! 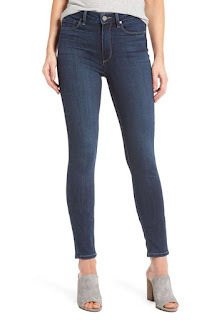 I'm obsessed with jeans and finding the perfect pair, so I'm trying a new-to-me brand. It's high waisted which is new to me, so I'll let y'all know how it works for me! This brand is a tried and true favorite for me, too. 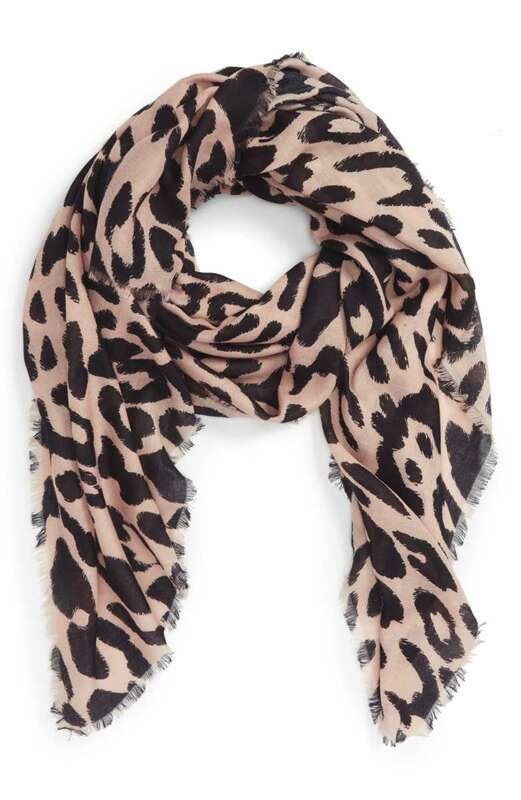 This will transition easily into fall with a cute sweater or jacket! I'm not sure how much I really need this tank so we'll see how it goes. If it's not a must, I'll return it and get something in it's place! I do love the scallop hemline too! Since the Nordstrom Anniversary Sale opened for cardholders early this morning, I thought today I'd share a few fall outfit inspiration photos because y'all know I woke up early this morning to shop! I posted yesterday a Beginner's Guide to the NSale, so if that's you (or if you're already a seasoned pro) make sure you read it! I'm still debating on leather leggings, but I do love how Kim K styled a pair. Out of all five looks, which is your favorite for fall? And make sure you check my IG tonight for a really fun giveaway!! It's the day before the early access NSale and some of us are double checking our plans (and bank accounts) and some of us have no idea what the NSale even is! Because the nearest Nordstrom is 1.5 hours away in Nashville, I had only occasionally shopped online at Nordstrom in the past. Last year when the sale was beginning and I was reading everyone's posts on it, I had no idea how major this sale really was. I wasn't a card holder last year so I had to wait until the sale opened to the public. I really had my eye on three things: a blardigan, Zella leggings, and these Nikes. I went to Nashville with a friend to shop in Nordstrom the day the sale became public. They had one blardigan in store that wasn't the color I wanted, the Zella leggings were sold out, and so were the Nikes. Luckily, Victoria had bought an extra blardigan and mailed me one all the way from Texas! #realfriends I never got the leggings and I ended up getting the Nikes online but at a half size too big. This year was going to be different. I'm now a cardholder and I've got a game plan (and a budget 😁). So for those of you who may not know what this sale is all about or why it's even that big of a deal, this post is for you because I used to be you! 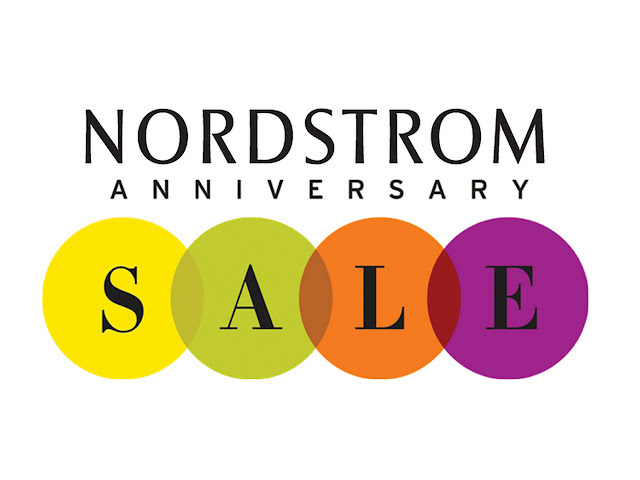 The NSale is where Nordstrom takes upcoming fall fashion and puts it on sale! This is different than any other sale because every other store puts clothes on sale when they are going out of season. Nordstrom will put fall/winter clothes on sale now so you can stock up for future months. Can I still apply for a card? You can! All of the big fashion bloggers posted that this past Sunday was the last day you could get a credit card, but Loverly Grey posted yesterday on her IG stories that you can still apply! For those of you who know me well know that I am anti-credit card. Dustin and I pay everything with cash and if we don't have the money then we don't buy it. (We're not really Dave Ramsey followers but do like this aspect of his philosophy.) We actually have one credit card between us that we only use for our Netflix monthly charge and on vacations. But out of complete desperation, I got a Nordstrom credit card in order to shop this sale early. This is what I'm excited about: you can pay it off immediately online. You don't have to wait for a bill--just pay it off online after you use it. That's what I like because I do not like any sort of debt! What are the sale dates? Early access (those who have the credit card) can shop July 13-20. The sale opens to the public July 21-August 6. All prices go back up on August 7. When can I see what's on sale? You can see the catalog here but it's not really my favorite. Honestly, you'll just have to wait until tomorrow and check some of your favorite fashion bloggers because they should have posts tomorrow dedicated to the NSale. How easy are returns at Nordstrom? The easiest! It's free shipping and returns on everything all the time, so it's worth it to buy something even if you're not sure it'll work. 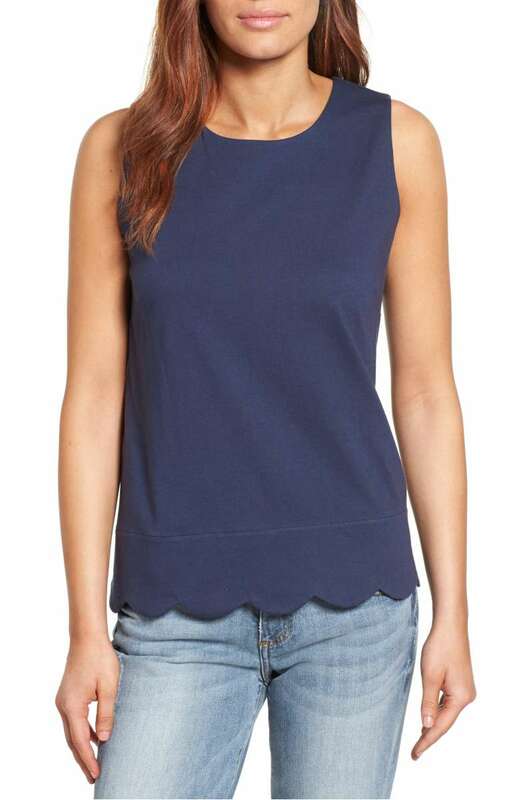 Sending back pieces are the easiest to Nordstrom and one of the main reasons why I shop online there. Since this is my first time to ever shop the early access part of the sale, I've got a few things listed that I want to check to see if they are on sale and the price before I purchase. I suggest thinking about items you need: new jeans, a jacket, Christmas gifts for others. Make a list and get those items first before you start browsing to buy things you really don't need but want to look at. If you're planning on shopping the sale, I'd love to know what you plan on buying! Cooking is a HUGE passion of mine, so I was really excited when today's Show and Tell linkup was about favorite recipes! All I really needed to do for this post was just tell y'all to go to my Recipes tab on the right side of my blog and click there since everything I've blogged is a favorite, but I thought I might as well feature a few, too 😜 I can't wait to read what everyone else blogs! 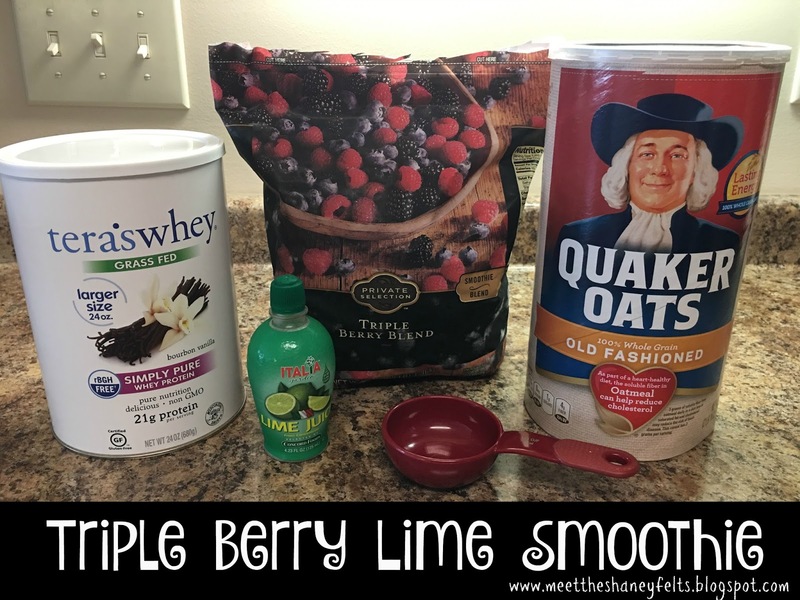 This Triple Berry Lime Smoothie is my favorite breakfast and sometimes supper if I'm not wanting something heavy. It's filling but also feels light so it won't leave you with that gross full feeling. This BLT Pasta Salad is the perfect summer lunch. Who doesn't love BLTs during the summer? 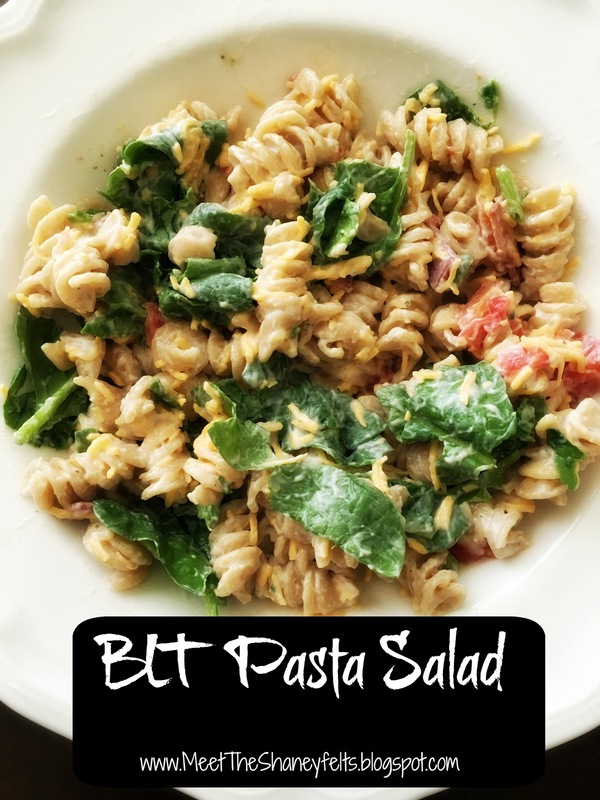 Take that and make it a pasta salad and you've got a lunch everyone will be asking you to make! 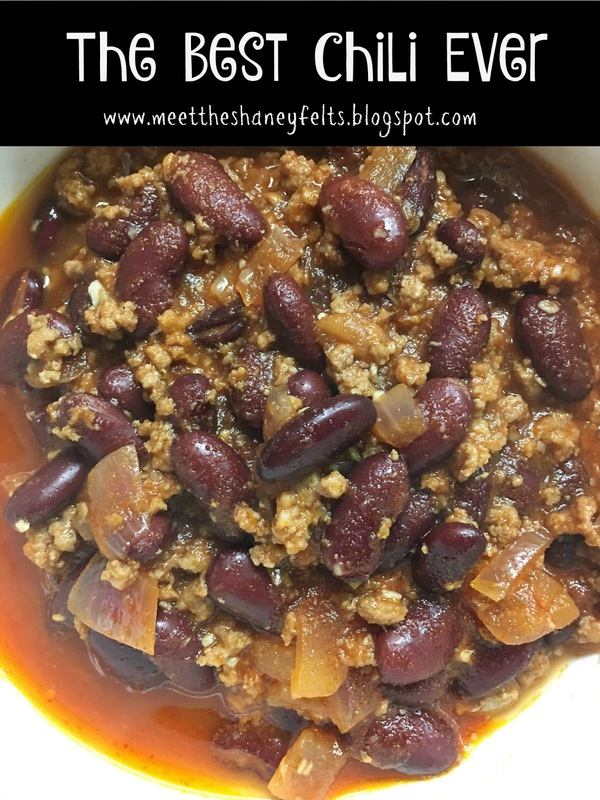 I'm obsessed with this chili recipe enough to name it the Best Chili Ever! I won't make chili any other way ever again, and Dustin LOVES this chili too! 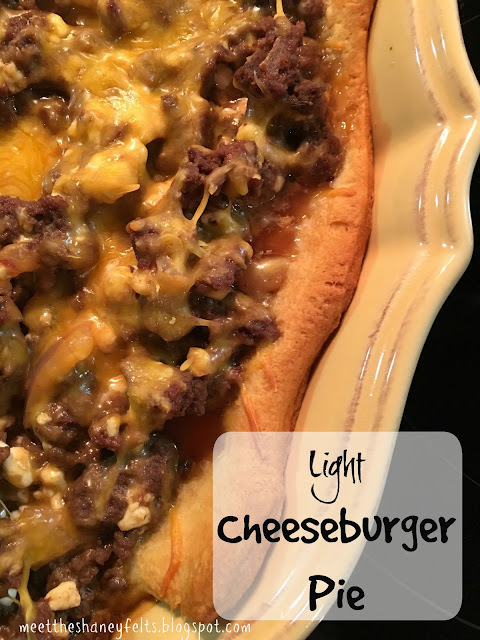 WE LOVE THIS Light Cheeseburger Pie in our house! My mom used to make a cheeseburger quiche when I was growing up that was so good, but I never made it once Dustin and I got married because it was fattening. 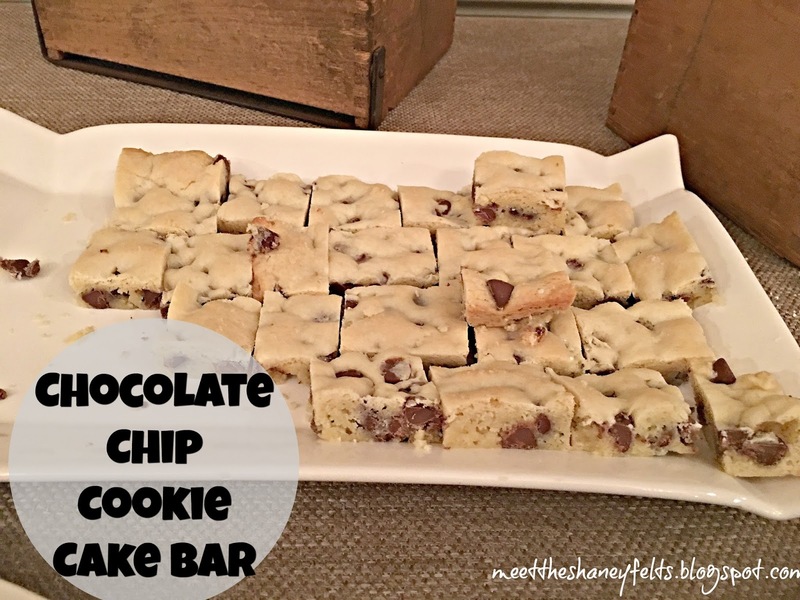 So I found a recipe similar to this and I adjusted it and added a few things and now this is a major favorite! Chocolate chip cookies + cake = my two favorite desserts, so I married them together and got these Chocolate Chip Cookie Cake Bars. This is the easiest dessert to whip up, and if you have to take a dessert somewhere, there's no chance in messing it up! It will turn out every time! 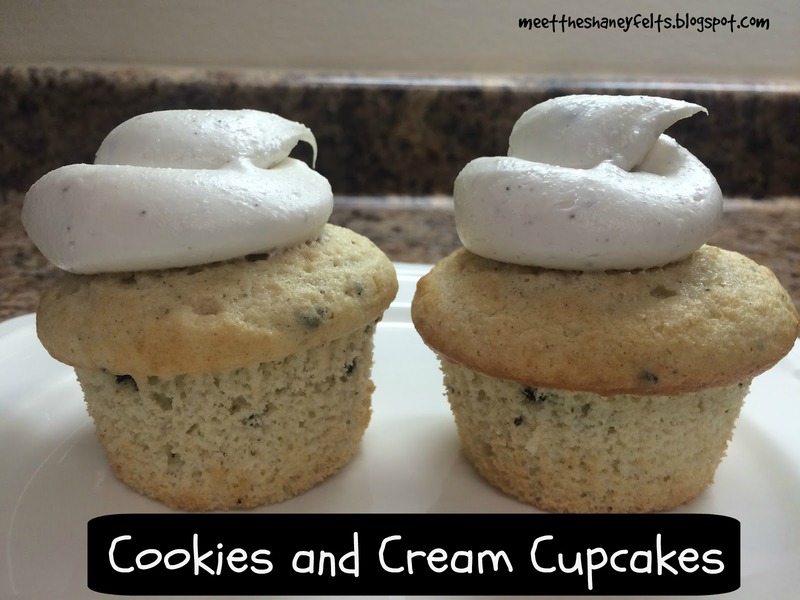 These Cookies and Cream Cupcakes are fluffy, moist, and delicious! As always, a special thanks to my sister at RAW Images Photography for these photos! Happy Monday! I hope your weekend was great and that everyone transitions easily into a week without a holiday. Those are always the hardest for me! As a teacher, I'm always looking for "school appropriate" clothes but I also don't want to wear clothes that age me. And sometimes during the week, I have dinner plans for after school and don't have the time to run home and change because I'm up at school still working. Enter the outfit above. The black swing dress, wedges, and necklace are perfect for teaching during the day. (Remember I told y'all that those wedges are my new favorite and the most comfortable wedges I've ever owned...for real) But if I am heading out to dinner that evening with some friends or teachers from school, I can throw on a cute hat and red lipstick to dress up my outfit from day to night. We all need go-to outfits that can transition easily from day to night. What's your go-to? May and June 2017 Book Review!